Diana talking to man with loaded AKM (Romanian AK-47) | Flickr - Photo Sharing! 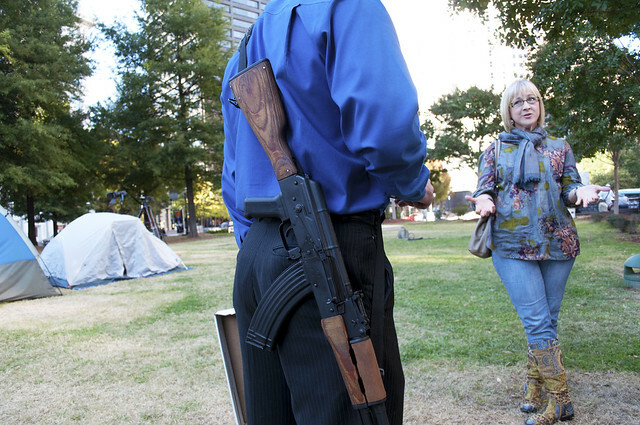 My girlfriend objecting to the presence of an armed man in Woodruff/Troy Davis Park. This is craziness. People can not sleep peacefully in the park but the opposition can bring in an assault weapon and no police effort to stop him? Exactly. That's the injustice and hypocrisy revealed in this photo. Oh, and by the way, Diana, the woman talking to the armed man was arrested on Nov.5th during a peaceful demonstration.